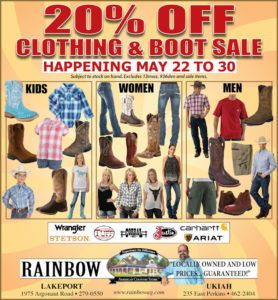 Save on all clothing and boots during the 20% Off Sale, May 22 through May 30. A perfect time to get a new outfit for the Potter Valley Spring Festival! 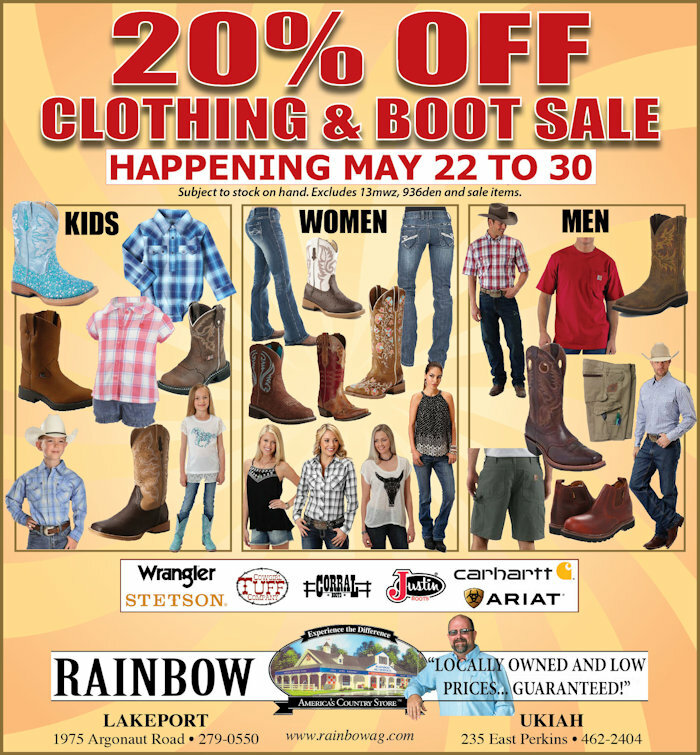 Check out all the great styles in the boot and clothing departments and save! Springtime! Green grass, warm weather, long days … ticks and fleas, foxtails and rattlesnakes! Got to take the good with the bad, so while we are out enjoying the nice weather, we need to be on the lookout for the “stickers” that can make a great day go bad for our pets. Insect pests have been particularly annoying this spring. Ticks are especially dangerous as they can transmit diseases that can be life-threatening – even some that transfer to humans. Prevention is key to preventing tick-borne disease. To learn more, read Pet Health Network’ article, 8 Tips for Keeping Your Dog Free From Tick Borne Disease. And, check out this month’s subscriber coupon from Rainbow Ag – Get any SpectraSure Plus product – for dogs or cats – for only $19.99! Download the coupon here. Foxtails and Rattlesnakes. As the weather heats up and the grass dries off, we head into prime foxtail season. 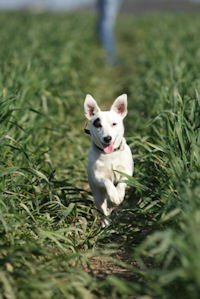 While we often think of foxtails as getting into ears, eyes, toes and noses (and that is certainly problem enough!) remember that the pointy little seed heads can also burrow into your pets’ skin and cause abscesses, or can even travel into the body cavity of your pet and cause life-threatening inflammation. Routine inspection and grooming is vital to getting to the foxtail before it gets to your pet! Rattlesnakes are also a danger to pets that roam outdoors. Be careful about letting your dog dig or nose around under rocks or logs where rattlesnakes like to rest. If you feel your dog is at risk, ask your veterinarian about the rattlesnake venom vaccine. Spring is a busy season at Rainbow Ag. 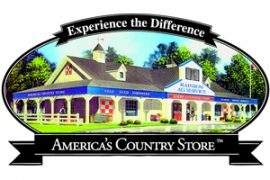 Of course, the clothing department is full of fun spring and summer styles for the whole family, and the livestock department is buzzing as 4H and FFA members prepare for the first shows and Fairs, but don’t forget that the garden and irrigation departments are fully stocked with everything you need to get your yard in barbecue-party shape! Using a drip irrigation system takes that daily watering chore out of your hands, and is a water-saving boon too. Drip irrigation can also be used to handle some other little chores such as keeping your bird bath or dog-water bowl filled automatically, or creating a mister area to cool off sensitive plants and animals! 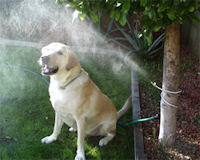 Don’t know where to start with building an irrigation system for your yard? Just ask one of Rainbow’s irrigation specialists and they will help you design the perfect system for your situation, whether it’s a few potted plants on the deck or an entire vineyard! 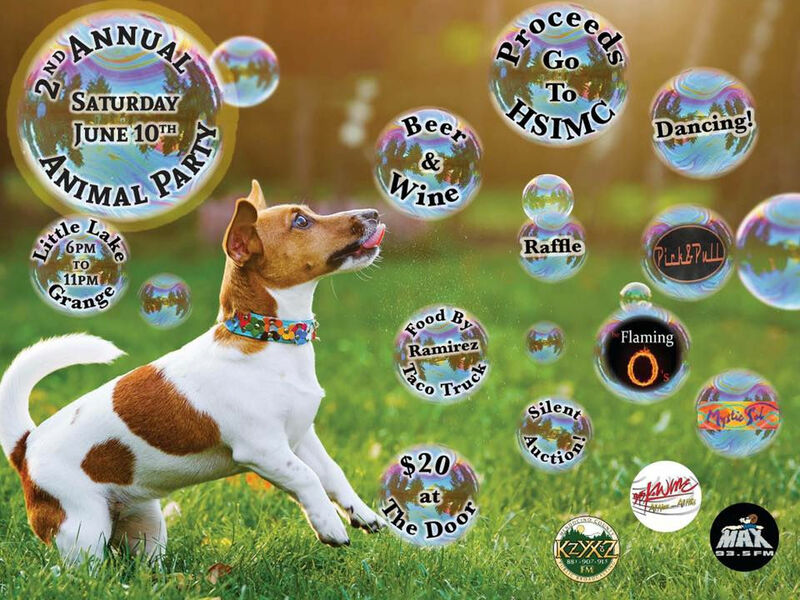 Don’t miss the Second Annual Animal Party, Saturday June 10th at the Little Lake Grange in Willits. All proceeds go to support the animals at the Humane Society of Inland Mendocino County. There will be fun, dancing, food by Ramirez Taco Truck, beer and wine and a silent auction. Come party for the animals! $20.00 at the door, 6 PM to 11 PM on June 10. More Information. Win a $15.00 Rainbow Gift Card! Enter the Trivia Game – every correct entry is included in a random drawing for a Rainbow Gift Card. April’s answer was, At the Kitten Fostering Workshop, you can learn how to socialize kittens! and the winner is Jennifer Roschi. This month’s question is, What are 4H and FFA members preparing for? Enter HERE! This entry was posted on Friday, May 19th, 2017 at 3:07 pm	and is filed under News, Rainbow Wags Newsletter. You can follow any responses to this entry through the RSS 2.0 feed. Both comments and pings are currently closed.